In partnership with Ventura College and Animo Productions to benefit the Ventura College Foundation, offering over $500,000 per year in scholarships to Ventura College Students. 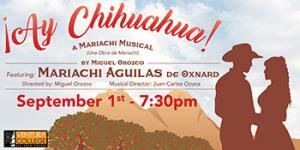 Sponsored by Ventura College and Produced by Animo Theatre Company, Featuring Mariahi Aguilas de Oxnard, Directed by Miguel Orozco, Musical Director: Juan Carlos Ozuna and Featuring some Ventura College students as cast members. Show your Eventbrite barcode at the will call window to receive a printed ticket.